With a different holiday always just around the corner, retailers often struggle just to keep up with trends and diversity of inventory to satisfy the season. But there are also economic realities that come with operating a retail business and they often require a quick turnaround or infusion of funds to get the inventory needed just to compete and stay afloat. For larger retailers with terms on their inventory purchases this isn’t an issue. But with medium and smaller retailers who rely on bulk inventory purchases, the lack of funds needed to purchase at the right price can make or break a season. Term Loans: This common type of loan has the greatest flexibility in terms of amounts and repayment terms. If a retailer is looking to start or expand a new location a term loan can get the store up and running. They are most commonly used by businesses that have an established operating history and a good credit history. Merchant Cash Advance: If a retailer doesn’t have the credit rating of a larger operation, or if they can’t qualify for a better rate through a traditional lender, this may work short term. A merchant cash advance uses future sales to calculate a payment for use as operating cash. It can vary over time as it is tied to sales and the rate is more expensive than a traditional lender, but it can be used as a bridge as well. Inventory Financing: This method allows a retailer to use their existing inventory as collateral against the amount borrowed. These are very short term bridge loans and if a retailer can pay back in a short period this method may do the trick. One caution to consider with inventory financing; there are often “inventory aging” requirement so inventory older than a certain age may not be considered as part of the loan structure. For example, some inventory financing companies will lend up to 80% of the value of inventory that is less than 180 days old (or some other length as determined by the lender). Once the retailer has secured the funds needed, they need to be allocated to give the biggest bang for the buck, so to speak. 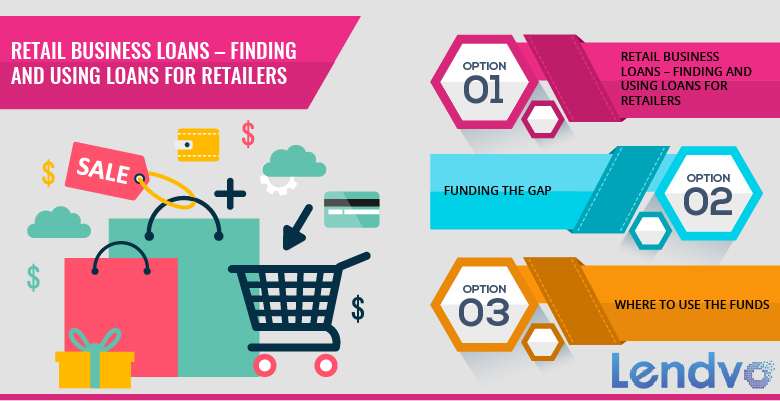 There are many places to put the money from the loan to good use within the retailer. Open a New Location: As mentioned in the discussion of the term loan, many retailers opt to use their loan to open a new location. If the customer base is large enough and sales and demand hold over time, a new location can generate the cash to repay the loan as well as generate profits. Buy New Inventory: Many retailers attend supplier trade shows and purchase in bulk. With a retail business loan a retailer can lock in better pricing in larger quantities than simply ordering lot to lot. And nothing turns customers away more than the words “out of stock”,” backorder” and “raincheck”. Using the proceeds of a retail business loan to add new products and fresh inventory can make or break a season. Up the Tech Game: Staying up to date in technology can often mean the difference between being ahead or behind the competition. Using a retail business loan for updating store technology systems can pay big dividends. Some options include an updated or new POS system, a store app that ties directly into online shopping and inventory monitoring systems to make sure that the right inventory is on hand at the right time. In addition to keeping the retailer at the head of the tech game, it can also help reduce labor costs and provide statistics and data analysis allowing the retailer to make better enterprise decisions based on data trends. Hire Employees: Some retailers produce a significant portion of their yearly sales in several key seasons throughout the year. Seasonal Halloween stores operate just in a single season. As part of the $2.5 billion Halloween market these stores often rent in only three month periods and hire and staff only for that season. While most retailers operate year-round and focus on several key seasons, having the funds from a small business loan available to hire staff competitively will help keep an operation’s sales lines moving quicker and more efficient. Remodel: Sometimes a retailer’s biggest and best marketing tool is the look and atmosphere of the store itself. If color trends are out of date and interiors are looking a bit down and out, many customers will be turned off. Using the proceeds from a retail business loan can help update the store interiors and fixtures and keep the look fresh. Short term cash flow headaches are frequent for many retailers. But as discussed above when thought through as to both the type of loan needed and the use of the loan acquired, retailers can stay competitive, improve their performance and maximize profits without being overburdened with the loan payments.